Are You Bombarded by Mind Chatter? Are you bombarded by mind chatter? Are you cranking things out at work, rushing, meeting deadlines, just getting it done? Are you plowing through your projects, checking them off so you can get to the next project? At home are you continually checking email, social media, your cell phone? I’m not referring to the natural sense of order for those of you with Workability energy. What I am referring to is all of that chatter in your mind that simply runs the show – do more, do it faster, do it better, do, do, do! How can you break that cycle of constantly doing and allow yourself some space? When do you take the time to “be,” allow yourself those quiet spaces to gentle into your own rhythm? Consider allowing yourself to be in a moment without thinking about it, analyzing it, or wanting it to be something other than it is. It can feel like we are being pulled in every which direction with questions, demands, requirements, and “shoulds.” How can you take deliberate, intentional action to unplug from all of those demands? I know that sounds contradictory – how can you take action to simply “be” and not “do” anything. However, it does take intention, especially when you are enmeshed in the continual demands of your life. Here is an example of the demands originating in your own mind. I have been thinking, thinking, thinking about what to write for days (well, weeks) and couldn’t get a start. Again, that’s not accurate. I have at least 5 starts, but nothing seemed like something that might connect with you. So, here you go – what is the one thing you can do today to slow yourself down, to breathe? It can even feel selfish to slow down and do something for yourself. Not that you need it, but I give you permission to slow down. Sometimes we need someone else to tell us it’s ok to do something for ourselves. That’s me for you today, until you can give yourself permission to slow down. 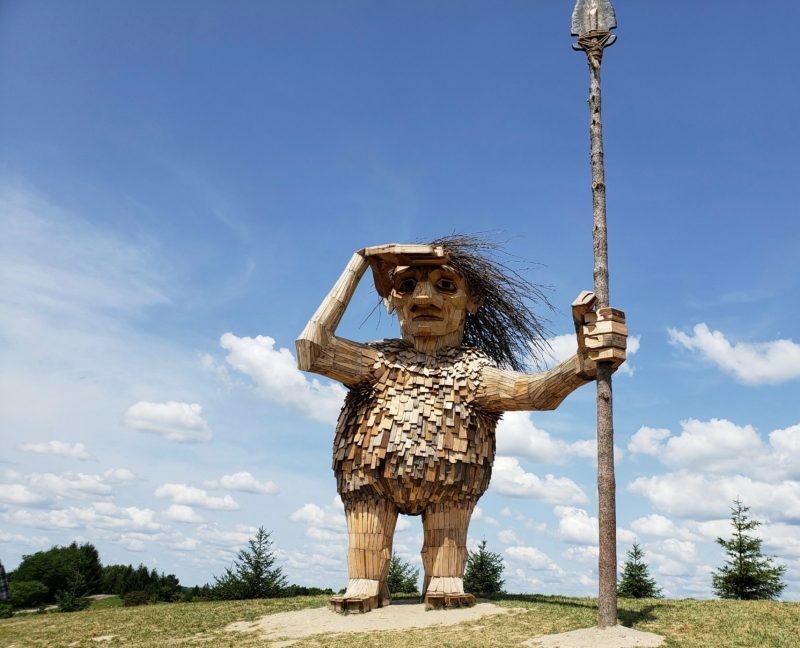 The troll image above is from the latest art installation by Thomas Dambo at the Morton Arboretum. 2 Responses to Are You Bombarded by Mind Chatter? What I’ve learned from Cindy is that there is a difference between “being” and “being lazy”– She helped me discover, understand, and utilize my strength and ability in “being” my natural self. Still requires discipline, but draws on my strengths, not resistance. Now I teach it to my students, and they are stronger!